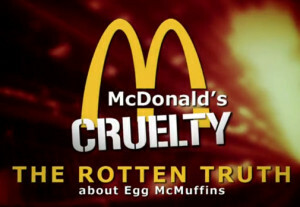 The Rotten Truth About Egg McMuffins EXPOSED. A disturbing undercover investigation of McDonald’s egg supplier, Sparboe Egg Farm, was conducted by Mercy for Animals. They exposed the fast food giant’s secret ingredient: shocking cruelty to animals. Investigators went in to the egg farm facilities located in Iowa, Minnesota and Colorado with hidden cameras and caught their heinous acts on film. The film below shows hens crammed into filthy cages with less space for each bird than a standard size sheet of paper to live there entire miserable life. They are unable to move or fully stretch their wings or engage in other natural behaviors. 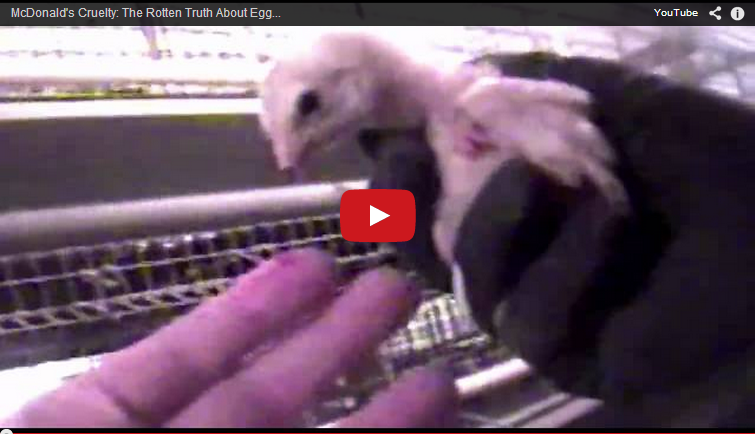 Workers were seen grabbing hens by their throats and ramming them into the small battery cages. 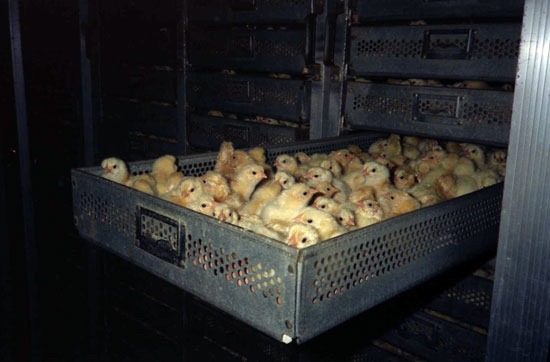 Workers also burned off the beaks of young chicks without any painkillers and then throwing them into cages, where some missed the cage doors and were thrown on the floor. Rotten dead hens were found, decomposed beyond recognition as birds. They were left in cages with hens that were still alive and laying eggs for human consumption. Other live chicks are thrown in plastic bags to be suffocated. One worker is shown tormenting a bird by swinging it around in the air while it’s legs were caught in a grabbing device, violence described as “torture” by another worker. Many chicks were trapped and tangled in wire cages while others suffered from open wounds and torn beaks. Animals should be given at least the freedom to walk, stretch their limbs, turn around and engage in natural behaviors. 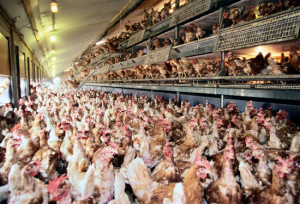 However, this McDonald’s supplier, Sparboe Egg Farm, deprives these hens of these simple basic freedoms. Dr. Sarah Shields, a science researcher, poultry specialists and consultant for animal welfare, condemned battery cage egg production after viewing the undercover footage. There is also a big concern with the spread of disease from dead hens decomposing around the live hens that are laying eggs for human consumption. However, even with this knowledge, McDonald’s continues to feed the world population with these potentially diseased eggs. While McDonald’s has a moral obligation to lessen the cruelty of these animals and the purchasing power to do so as well, these hens are still abused and exploited to produce eggs for its restaurants. Consumers also hold an enormous amount of power. You can prevent this from continuing by not purchasing McDonald’s products. McDonald’s Just Recalled 1 Million Chicken Nuggets, The Reason Why Will Sicken You!